When we decide to breed a rough Collie puppy litter, much thought and planning occurs as, we strive to achieve improvements in every breeding. We raise each rough Collie litter with the intention of keeping a rough Collie puppy (or two at most) for the conformation show ring and for future breeding, with the remaining intended to enrich the lives of families who seek us for Collie puppies. Our Collie breeding program is very limited (averaging about one litter every few years), and our Collie puppies that are sold as pets receive care identical to those destined for the show ring. All are raised in our rural Michigan home environment and are socialized and exposed to many situations to which they must become accustomed as adults, such as car rides, household noises, other non-Collie pets, and being groomed & handled regularly. Through all these situations, we attempt to make the transition from our home to the Collie puppy's new home as stress free as possible. All Taliesen Collie Puppies are current on inoculations, receive a negative stool check and/or are de-wormed if needed. They receive a general health examination and a CEA eye examination for the presence of hereditary eye disease by a licensed veterinarian with many years of canine eye examination experience. Taliesen Collies will provide to all new owners a written health guarantee, puppy food to get you started, information on caring for your rough Collie puppy, and both a towel and toy with the scent of their siblings and mother on it to help ease the adoption transition. Additionally, we will provide you with a CD of pictures of your Collie puppy showing your puppy's development since birth. Occasionally we may have older rough Collie puppies or young Collie adults available to loving family homes, since we sometimes grow out a pair of Collie puppies from a litter, and then only later decide on keeping one or the other. Any of our Collie puppies, young Collies, or adult Collies come with our same written health guarantee, and are usually house and leash trained, and all are placed with a return guarantee that they are welcome back at any time. 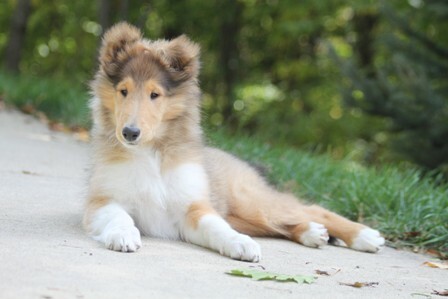 If we have no rough Collie puppies available for sale, we are quite willing to refer inquiries to other reputable rough Collie breeders with similar breeding philosophies. We always encourage careful consideration on the part of all prospective puppy adoptors to be sure that a Collie is the perfect breed for them. Therefore please go to the RESOURCES PAGE to learn more about the Collie Breed. Thank-you for your interest in Taliesen Collies, where collie puppy litters don't happen often, but they are certainly worth waiting for! When we are accepting names for prospective families, we encourage those interested to complete our "PROSPECTIVE BUYER QUESTIONNAIRE". Once completed, you can participate in our screening process. This is not intended to discourage anyone, but to reassure you that we do everything possible to ensure that our rough Collie puppies are placed in the right home environments that fit their unique temperaments. PLEASE NOTE: Shipping is not an option. We prefer to meet the families who are selected to welcome one of our Collies. ALSO, we do not sell "breeding stock" Collie puppies. Our rough Collie puppies come with the requirement to be spayed or neutered before receiving Limited AKC Registration paperwork. Photos of our 2012 litter from birth and beyond can be viewed on our FB page. We do not have anything available at this time. Watch our 2016 winter litter grow and develop on Facebook.